The RS-28 Sarmat intercontinental ballistic missile known in Russia as „Satan 2“ will be the world’s heaviest and most powerful nuclear missile when it is complete. Satan 2 missiles are capable of carrying nuclear warheads with payloads of up to 20,000 kilotons – more than one thousand times more powerful than the bomb dropped on Nagasaki. At maximum payload a direct hit on New York would kill 4.5million people, injure 3.6million, and send radioactive fallout stretching more than 600 miles. The „Texas Killer“ is Russia’s newest nuclear missile design, and when completed will be the heaviest weapon of its kind to ever be deployed. It can reportedly carry 10 heavy nuclear warheads and is designed to break through U.S. missile defense systems. Last year, the Defense Ministry’s Zvezda news agency claimed Sarmat was so powerful, that a single missile could evade Washington’s defenses and wipe out the entire state of Texas. But, the Russian scientists in charge of developing Satan 2 have suffered a setback which means that it won’t be ready until later this year according to the Moscow Times. Fears over all-out nuclear war are now at fever pitch after Kim Jong-un revealed that North Korea is ready to launch its most powerful nuke ever. Donald Trump has not allayed fears by preparing to set up a missile system on the border with the secretive state. In January it was also revealed that the US was planning a surprise nuke attack on China and Russia. Russia’s State Rocket Center named after Makeyev has declassified first photos of MS-28, Sarmat missile, better known as „Satan 2“. The nuclear capacity of the new missile is enough to wipe out the US East Coast in a few minutes. The „Satan 2“ missile appears on the website of the design bureau under the title „Experimental design work „Sarmat.“ The state contract for the development of the new missile was signed in June 2011. The purpose of its creation is to ensure guaranteed and effective implementation of nuclear deterrent tasks by Russia’s strategic forces. The new „Satan-2“ missile will replace RS-36M „Satan“ – the intercontinental missile nuclear complex that was developed in the 1970s by Yuzhnoye Design Bureau. „Satan 2“ has thus become the world’s most powerful weapon. The capacity of the missile is 40 megatons, which is 2,000 times the capacity of the bombs that the USA dropped on Hiroshima and Nagasaki. According to Dr. Paul Craig Roberts, Russia’s current SS-18 Satan warhead can destroy 3/4 of the State of New York, while 5-6 warheads will be able to wipe out all the US East Coast. One Satan-2 missile can carry up to a dozen of such warheads. Satan 2 will be put into operation in 2018. Is the world about to enter a dangerous new nuclear phase that will once again heighten global tensions between superpowers? Yes, if one recent report is to be believed. As noted by the UK’s Mirror, Russia is gearing up to test-fire a nuclear weapon which supposedly is powerful enough to wipe out entire countries in a single massive strike. The “Satan 2” is rumored to be the most powerful nuclear design ever, and what’s more, it is believed to be equipped with new stealth technology to make it invisible to enemy radar systems. In what some will surely call a doomsday weapon, when fully developed and deployed it may never have to be used in order to put Moscow at the head of every negotiating table for the foreseeable future. And it is most likely keeping U.S. military and intelligence officials up at night, if it exists, as current missile defenses are quite probably ineffective against such a weapon. The weapon’s official name is the RS-28 Sarmat, and it is slated to replace existing but aging Soviet-era R-36M missiles, which NATO code-named “Satan” back in the days of the [first] Cold War. “In this sense, the Sarmat missile will not only become the R-36M’s successor, but also to some extent it will determine in which direction nuclear deterrence in the world will develop,” the Russian news network Zvezda reported. The first prototype missiles have already been built. The first test launches are scheduled for later this year. Should the tests prove successful, the Sarmat will enter into full production so that it enters operational service in 2018. There is not much hard data available on the massive missile, but what information is publicly known suggests a system that is extremely formidable, like the appropriately named “Satan” system it will replace. That said, Russia did not develop the Sarmat completely from scratch, The National Interest (TNI) reported. The new missile uses a modernized variant of the Voyevoda’s liquid-fueled rocket motors; it will be equipped with four RD-274 engines to power it through its first phase. The Mirror noted that some believe the 100-ton missile, which has a 10-ton payload, packs enough nuclear explosive power to destroy a country the size of France (or a U.S. state the size of Texas, where a sizable portion of U.S. military power is based). TNI noted further that U.S. and Western intelligence estimate that the Sarmat may carry as many as 15 independently targeted nuclear warheads, and has a range of 6,000 miles. Once it is deployed it will become the largest ICBM ever built. 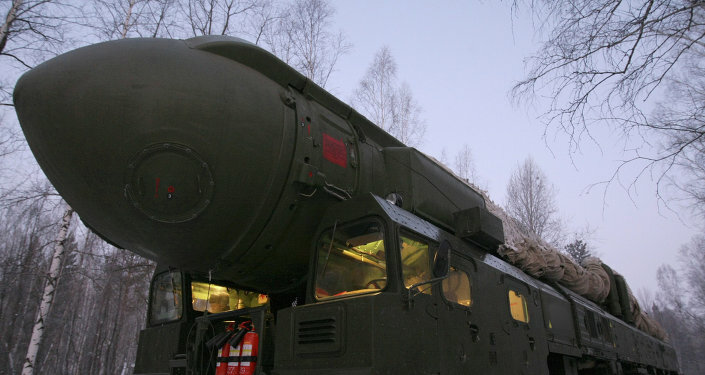 “Like other modern Russian ICBMs such as the Yars, Topol-M and the Bulava, the Sarmat is being designed specifically to overcome ballistic missile defenses using a combination of decoys, a host of countermeasures and sheer speed. It might also be equipped with maneuvering warheads—which would make it much more difficult to intercept,” The National Interest reported. As for the U.S., the Air Force has launched preliminary development on a new Ground-Based Strategic Deterrent system which includes a new bomber, the B-21, to replace existing Minuteman III ICBMs. Currently, the service is upgrading the missiles, but Air Force officials have testified before Congress that they don’t believe it will provide assured deterrence as enemy missile defenses rapidly improve. In the nuclear age, global conflict on the scale of the world wars is viewed as impossible to fathom, not just unlikely to occur. But if you remove the nuclear-deterrent factor – if somehow, someday, they are taken out of the response equation and not replaced with a weapon equally destructive – we will see war on a global scale once again. Iran’s top cleric Ayatollah Seyyed Ali Khamenei on Wednesday called the US an “arch-tyrant and the great Satan”. “The US is the arch-tyrant and the great Satan. Those who implement US policies in the region are adherents of tyranny,” Press TV quoted Khamenei as saying. He also accused some Muslim countries of betraying their people by helping the US implement its policies in the region. “Some Islamic governments are betraying their people and the Islamic Ummah and paving the way for the American influence,” Khamenei told participants at an international Quran competition. “I say that you (Israelis) will not see the coming 25 years and, God willing, there will not be something named the Zionist regime in next 25 years“, he said. “With Allah’s help, there will be no such thing as a Zionist regime in 25 years”. “Secondly, until then, struggling, heroic and Jihadi morale will leave no moment of serenity for Zionists”, Khamenei said. The statements, made in front of hundreds of Iranians in Tehran, appear to contrast the more conciliatory tone of President Hassan Rouhani. n nuclear deal this 2015 is not so much reliant on how promising the proposal is. News reports suggest that the United States and our negotiating partners are poised to make concessions that would undermine our ability to ensure that Iran remains without the uranium enrichment capacity and technology necessary to develop nuclear weapons. Wyden said his parents escaped Germany in the 1930s, but not before both of his grandfathers lost their livelihoods and his father was kicked out of school for being Jewish. We can always think of ways of making a deal better. The Islamic Republic supports Syrian President Bashar al-Assad and Lebanon’s Hezbollah militants. His latest remarks are likely to be seized upon by critics of the agreement as proof that Iran can not be trusted. Tehran threatens Israel after strike attributed to the IAF killed six Hezbollah fighters and six Iranian military men, including a general. After confirming one of its generals was among those killed in an airstrike attributed to Israel in the Syrian Golan on Sunday, the commander of Iran’s Revolutionary Guards (IRGC) said Tuesday that Israel should expect “devastating thunderbolts” in response to the attack. Tensions in the Golan Heights have been high since Sunday, when a helicopter fired two missiles, killing Jihad Mughniyeh, Hezbollah’s commander of the Syrian Golan sector and the son of master terrorist Imad Mughniyeh, along with five other Hezbollah fighters and six Iranian military personnel – including Iranian General Mohammed Ali Allah Dadi of Iran’s Revolutionary Guard. The attack was largely attributed to Israel, but so the IDF has neither confirmed nor denied the reports. The IDF raised its alert level on the northern front on Monday, in positions along the border with Syrian and Lebanon, as foreign media outlets reported that Iron Dome batteries were being deployed in the North. Apart from the deployment of the missile interceptor batteries on the northern front – reported by Sky News in Arabic – there has not been a significant reinforcement of the forces on the border. Yet, there are concerns in the security establishment that Hezbollah will attempt a retaliatory terror attack against Israeli forces which operate along the border. Thus, the soldiers were ordered to increase their level of alert and preparedness. The international community is also concerned of a retalitory attack – France and the United States were working together on the diplomatic level in an attempt to keep restraint among all sides, Lebanese newspaper An-Nahar reported. Hezbollah sources told the paper the organization’s response to the attack will likely happen outside of Lebanon. Newspapers affiliated with Hezbollah estimated that organization chief Hassan Nasrallah will make a speech soon to respond to the attack. Nasrallah was scheduled to speak on February 16 on the 7th anniversary of Imad Mughniyeh’s death, as he does every year, but some believe he will speak as early as next week. Iranian Supreme Leader Ayatollah Ali Khamenei has called on Muslims across the world to unite against Israel over the ongoing crisis in Gaza. Stating that Israel is benefiting from the “Islamic world’s negligence”, Khamenei hailed Iran’s standpoint on the conflict. “Zionists are committing these crimes taking advantage of the Islamic world’s negligence. The massacre in Gaza by Zionists should awaken Muslim governments and nations to leave any discord and get united,” he said at a meeting, which was also attended by Iran’s President Hassan Rohani and other cabinet members. The Iranian administration has also been condemning Israeli forces for their deadly attacks that have claimed a number Palestinian civilians. The latest remarks follow the promise of Hossein Sheikholeslam, Iran’s director general of the parliament of international affairs, to support the cause of Palestinians “with all its might”. In the week-long confrontation, at least 178 Palestinians have been killed and more than 1,000 injured. So far there have been no casualties on the Israeli side.